Hitting the Wall? Is The Fed About to Make a Mistake?Hitting the Wall? Is The Fed About to Make a Mistake? Not surprisingly, the Fed increased its benchmark rate by 0.25%. The market fully priced this in. 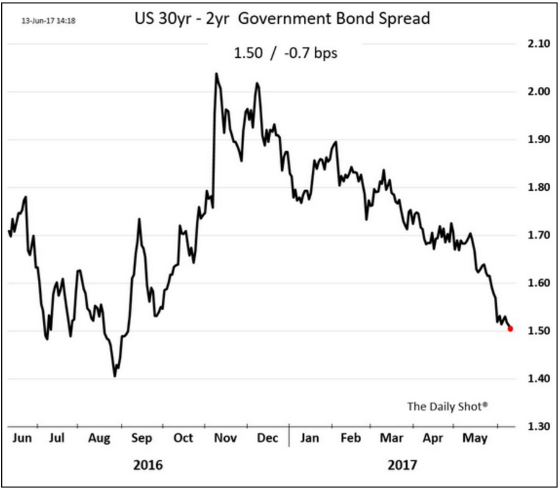 What is more surprising is the Fed telegraphing two more hikes in 2017 and commencing a slow reduction in its holdings of Treasuries and mortgage-backed securities beginning at the end of the year. 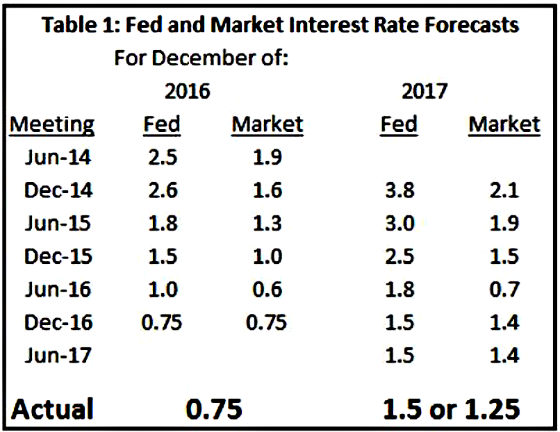 Contrary to the Fed’s intentions and desires, the market does not believe the Fed will be able to pull the trigger twice in 2017. In fact, it doesn’t see another increase until 2018. Larry Summers believes the Fed might be making a mistake if it continues to raise rates in the face of very soft inflation numbers. 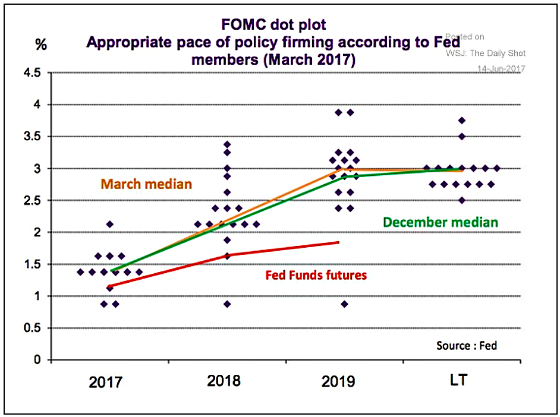 He shows how poor the Fed’s dot plot has been in terms of projecting future Federal Funds rates compared to the market. The Fed has consistently needed to lower its forecast much more aggressively than the market as the following table shows. 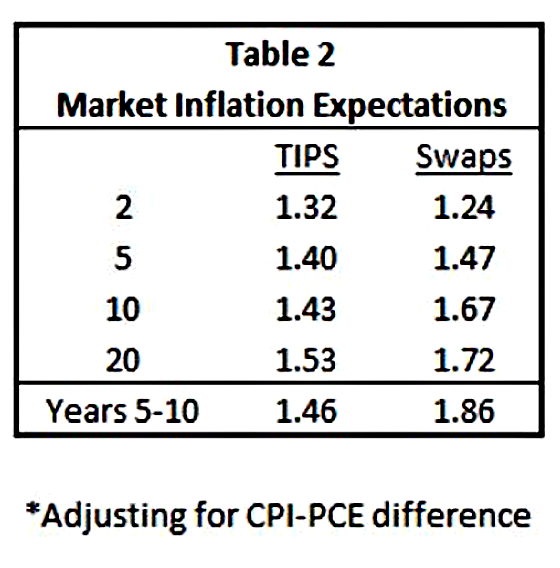 This next table shows how much more hawkish the Fed is than the market in terms of future Fed Funds rates. I would bet on the market. 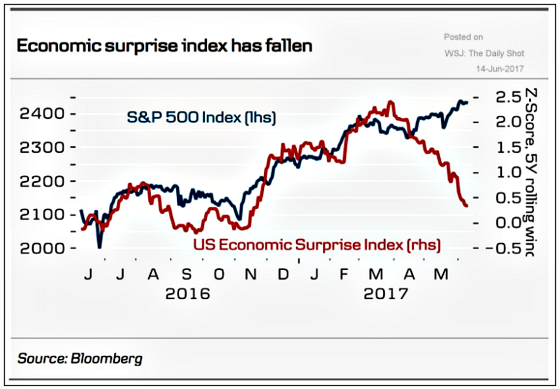 Perhaps the Fed is looking to the stock market for clues about future economic output. Unfortunately, it looks a bit disconnected from reality as it has continued to go up in the face of disappointing economic news. In the past, they were nicely correlated. Now they seem to be negatively correlated which cannot go on for too much longer. Either the data will corroborate the market or the market will come down or stay flat for a while to match the data. 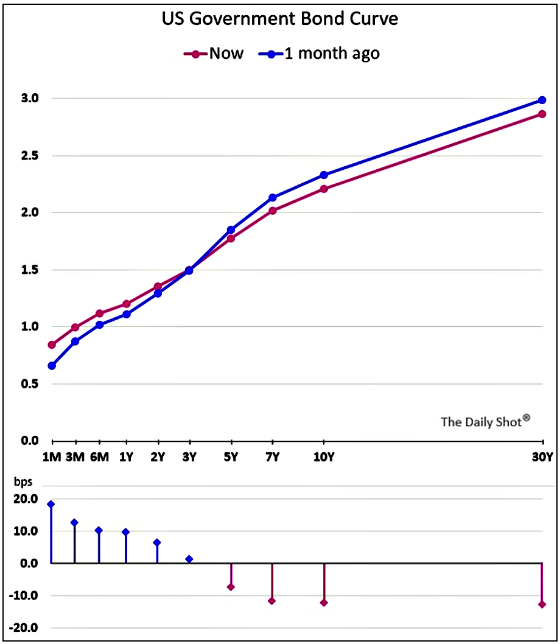 A flattening yield curve represents a narrowing of yields between long-term and short-term rates and is indicative of investors betting on a slowing economy. The next two charts show that this has definitely been the case over the past few months and now we have a more narrow spread than just before the election. Investors are bringing down their estimates for future inflation commensurate with a narrowing yield curve. Larry Summers used this table to show how investors see inflation being less than the Fed’s minimum 2% target going out 20 years. Another sign that the market is skeptical of future Fed increases in 2017 is that 30-day Libor has gone up approximately 57 basis points since December 2016, 90-day Libor has gone up 33 basis points, and six-month Libor has risen by approximately 14 basis points. This is further evidence that the market doesn’t believe short-rates will be moving materially higher. If it did, then the 90-day and six-month Libor rates would have gone up more rapidly. For example, here is how Libor changed for various maturities between January 2, 2015, and December 1, 2016 which was just prior to the Fed raising rates for a second time in this cycle: The market was factoring in higher future short-term rates which have materialized (three more times since December 1, 2016). This is the pattern one would expect to see when future rates are projected by the market: Longer maturities increasing more rapidly than the shorter ones to factor in future increases. The opposite is happening now. Slowing inflation, oil prices dropping, job growth slowing, the automobile sector ripe for contraction, Congressional paralysis, the President under investigation, and international tensions still very much present, just to name some of the economic headwinds, combined with a tightening Fed and reduction in its balance sheet looks to me like a recipe for some economic challenges in terms of the Fed creating more headwinds in a moderately growing economy already facing them. The one counter I would point out is that investors are a bit too bullish for continued lower 10-year Treasury yields, so it wouldn’t surprise me to see rates go up on the long end 0.25% or so before the bulls get washed out. I see this more of a short-term situation than any sort of cyclical or secular change. 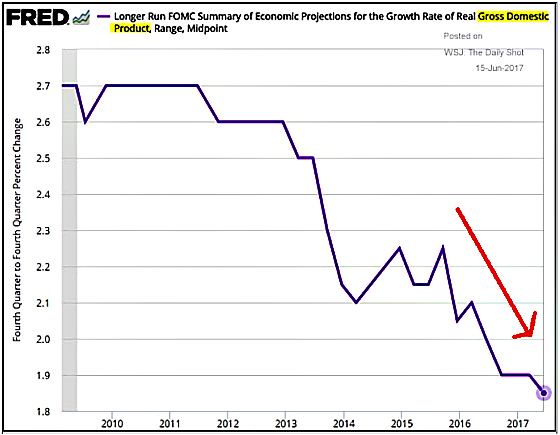 From the following table, it shows that the Fed is not totally oblivious to the continued, long-term slowing in GDP growth. Its forecast has shown a continuous drop in future GDP growth to a level less than 2%. This does not look like the type of chart and trend that would have the Fed tightening and cutting back the size of its balance sheet. 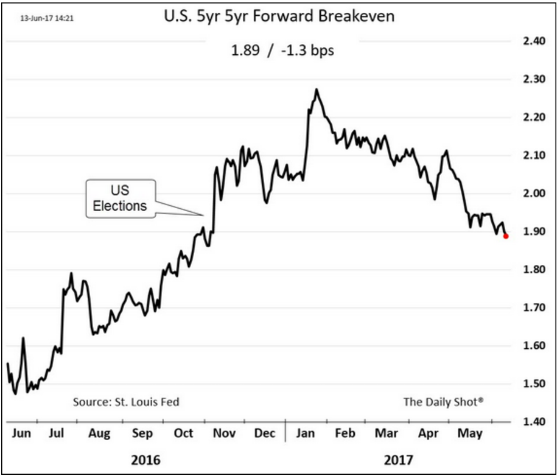 To me, it feels like the Fed might be hitting a wall in terms of its ability to raise short-term rates two more times in 2017 as it is telegraphing. The preponderance of data seems to support the Fed remaining on hold and seeing if economic growth picks up, inflation pushes above its 2% threshold, and more people enter the labor force. 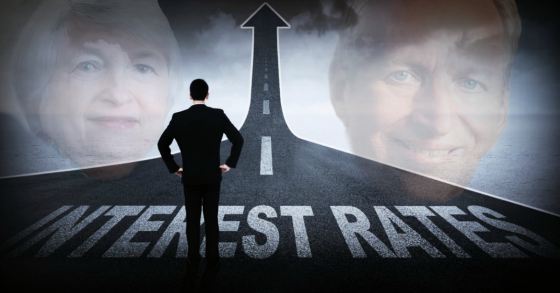 Are you team Yellen supporting two more rate increases in 2017 or do you support Larry Summers stance? I would like to hear your thoughts.